Deadmans Black-on-red seed bowl from the Museum of Northern Arizona collections. Click the image to open the San Juan Red Ware gallery. San Juan Red Ware is decorated pottery ware made in the northern parts of Coconino and Navajo counties, Arizona, and in the Four Corners region of Colorado and Utah. 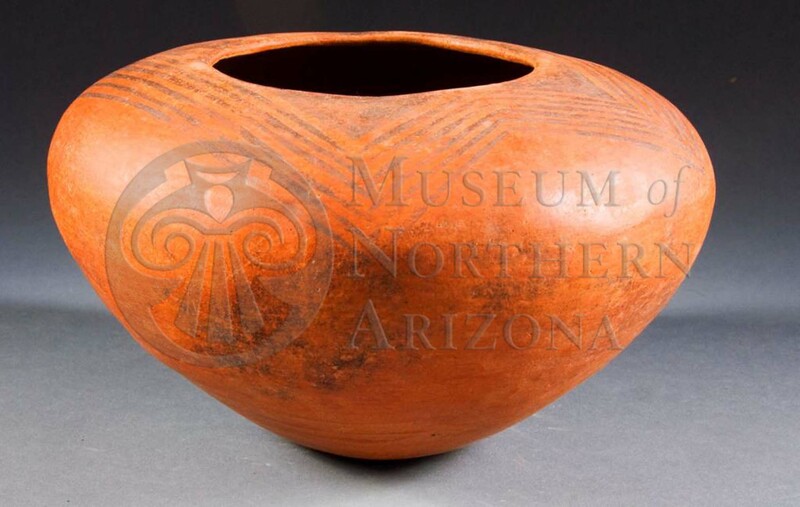 This ware was also widely trades to western and central Arizona. Types found in the American Southwest Virtual Museum include: Deadmans Black-on-red and Bluff Black-on-red. Date Range: Pre-A.D. 700 to 1150. Firing: In an oxidizing atmosphere at end of firing process. Core Color: Dark gray to gray, dark brown through brick-red to pink. Surface Finish: Bowls and decorative surface jar forms, smoothed polished. Surface Color: Red or orange; interior jar surfaces generally gray. Forms: Bowls, dippers, seed jars, pitchers, canteens (rare); bowls do not have horizontal handles. Paint: Black, red, black paint may appear brown, purplish, frequently dull or metallic; frequently polished after painting. Pigments: Black paint, manganese; red, hematite; rarely white (Machonpi Polychrome). A red paint for decorative designs came into use about the time the first pottery was made. A black paint that would not burn off , composed of manganese oxides, appeared about A.D. 800. A slip to make the orange pottery red was introduced about A.D. 1050. At about the same time, the use of crushed pottery sherds for temper was adopted. Between 1050 and 1100, a three-color polychrome was produced by leaving the slip off of certain areas of the vessel. Between 1200 and 1250, a four-colored polychrome was produced using white paint with orange, black or red. Comparisons: The distinction between San Juan Red Ware and Tsegi Orange Ware is based on three characteristics: Clay, temper and use of slip. San Juan Red Ware rarely has a slip, has sand or crushed rock temper. The clay frequently fires red or brown. Tsegi Orange Ware may have a slip, has sherd or white angular fragments in its temper, and the clay fires orange.